Cash is king. Or is it? After five years of disappointing returns from listed property and equities, many investors are wondering whether they should just cut their losses and switch into cash. The culmination of a host of factors precipitated the worst December for US equities since the Great Depression, and this had a knock-on effect globally. Creating uncertainty locally are the upcoming election, corporate governance issues, questions about land reform and, top of many investors’ minds, whether Moody’s will downgrade SA’s debt. Moody’s is the only rating agency who has maintained an investment grade rating on our local debt, so the implications of a downgrade could be significant. Billions of dollars would flow out of our bond market, which would put pressure on the Rand. The Rand was the worst performing emerging market currency in February, raising concerns that the inflationary impact could force the Reserve Bank to increase interest rates. This would increase the government’s cost of servicing its debt in a fiscal environment where the budget deficit is already too high. So, is there any upside? Well, as far as policy reform goes, there have been frequent comments that nothing will happen until after the election. But, despite vocal opposition from the trade unions, President Ramaphosa announced the unbundling of Eskom and Minister of Finance Tito Mboweni announced measures to reduce the public sector wage bill. The fact that these announcements were made before the election is significant, even though they were precipitated to some extent by the Eskom crisis. The fact that there was nothing in the Budget speech that could be considered as a “pre-election giveaway” is also noteworthy. Market sentiment is understandably cautious, but it is interesting that global markets currently have more faith in Brazilian President Bolsanaro’s reforms than in President Ramaphosa’s. This can be seen when comparing the cost of insuring a bond default by either country, with the cost being higher to insure default by SA, indicating a higher risk. This despite the fact that Ramaphosa has a legislative majority, which Bolansaro’s party doesn’t. With our government debt already rated as junk status on global capital markets, it appears less likely that interest rates would increase significantly even if we were to be downgraded. The fact that the Reserve Bank has managed to keep inflation well within the target range of 3%-6% (CPI is currently at 4.1%), means that there is some flexibility to leave rates unchanged during short periods of Rand weakness. Obviously, an extended period of currency weakness could change this, but would not necessarily be negative for the JSE given that 60% of the revenue generated by JSE-listed companies is sourced offshore. A weak rand strengthens the prices of these shares, and vice versa. What we also need to remember is that we are still a functional democracy, and institutions such as National Treasury and the Judiciary still operate with a reasonably high level of credibility, while progress has been made to restore State Owned Enterprises. Provided there are few surprises in the election, and that Ramaphosa secures a reasonable mandate, markets could react positively. After the negative return from SA equities in December, valuations are looking more attractive and, with this, the probability of inflation-beating returns has increased. SA interest rates are attractive relative to international yields, which is the case for many emerging markets. So, although cash may have been the best place to hide for the last three years, the probability of achieving after-tax returns above inflation in a stable interest rate environment is low. 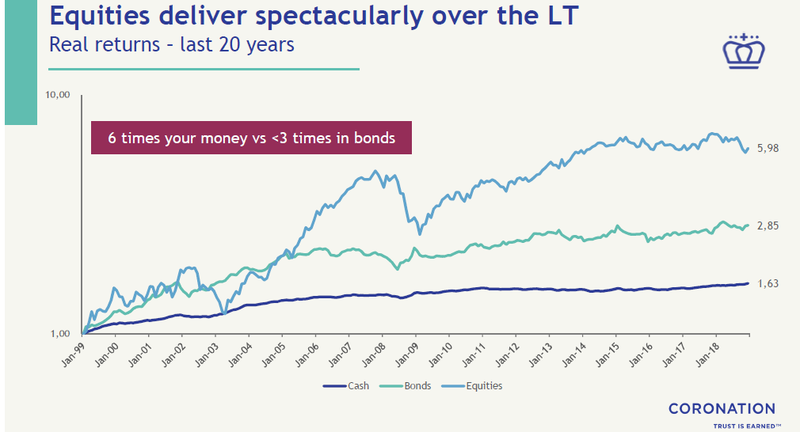 The above graph produced by Coronation gives credence to this – over the last 20 years, adjusted for inflation, equities have outperformed cash close to four-fold. With emerging market equities, bonds and currencies looking attractively valued, the appetite for higher yielding assets, including those of SA, looks set to improve. As penned by English historian and theologian Thomas Fuller, “the darkest hour is just before the dawn”. I ALWAYS find your commentary and insights helpful. Delayed gratification always outweighs immediate gratification (Gal 6:7). What Will Investment Markets Bring Us in 2018?